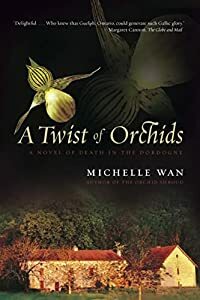 A Twist of Orchids by Michelle Wan, a Mysterious Review. Review: Fortyish ex-Montrealer Mara Dunn loves interior design and one-off antiques. Her recently acquired husband British expatriate, Julian Wood, the orchidist and landscape gardener she met earlier while investigating the disappearance of her twin sister, Bedie, is obsessed with finding a rare Cypripedium incognitum. But they both love each other, the French countryside of Dordogne, their homes – her house in Ecoute-la-Pluie (Listen-to-the-Rain) and his quiet-time refuge, a "poky little cottage" near the village of Grissac - their dogs, his a mongrel named Bismuth, hers the Pitbull sire of Bismuth named, Jazz - and French cuisine, including the wines. They've also gained a reputation among friends, neighbours and the local police as proficient amateur sleuths, and are now sorting out the red herrings from the real fish responsible for the murders of their 85-year old neighbour lady, Madame Gaillard, a 19-year-old French-born Turkish drug peddler named Kazim Ismet, and an undercover drug squad cop. Adding to their main menu challenge of murderous twists is a series of burglaries by a felon with a flair for doggerel vilifying the local police chief, a competition to acquire an endangered species of orchid, a lesbian alliance, ghostly visitations, and a plot to turn a pristine forest into an Americanized golf resort. And while the action proceeds, the characters come alive and emotions reign. The elderly Monsieur Gaillard's fear is palpable when he fights an apparition with a face that "is a tangle of colorless hair trailing like dead vines over a large, black hole." Young Kazim's terror is hair-raising when he is confronted by a cold blooded killer. Mara's frustrated with Julian when he refuses to discuss their future; his discontent boils over when her cleaning lady disturbs his routines. Mara worries that she's "destined to play second fiddle to a flower;" Julian's distressed that Kazim's death was somehow his fault. Over orders of escargots, plates of crayfish in tomato sauce and platters of aubergine fritters, they and their friends at the Chez Nous Bistro rant about the influx of drugs into the region. One friend claims there are, "too many damned immigrants in France," and another proclaims, "Bigotry knows no home," even as Kazim's father raves about the, "Thugs! Racist thugs! ", who have trashed the family's Turkish bakery. Then, there's Madame Gaillard's estranged daughter who refuses to attend her mother's funeral because of some long ago grievance that could affect her inheritance of the family farm and its potential development by a company with connections world-wide and ties even closer to home. Even the dogs, Bismuth and Jazz, develop identifiable personas as does the mysterious burglar who taunts the police with left-behind pieces of poetry and items of artwork not taken. With its sensuous language and evocative imagery Wan's story of its twist of orchids and twists of fate has action galore and sustenance aplenty to tickle the palates of even the most discriminating of Francophobes and mystery lovers. Special thanks to M. Wayne Cunningham (mw_cunningham@telus.net) for contributing his review of A Twist of Orchids. Acknowledgment: Random House Canada provided a copy of A Twist of Orchids for this review.